As a great show for seeing what’s new and happening in legal technology, learning about new products from vendors, and networking with other attorneys, LegalTech New York is the big place to launch new legal technology products and services. For the 2015 event, host Dennis Kennedy braved inclement weather and flight cancellations in order to attend the event. 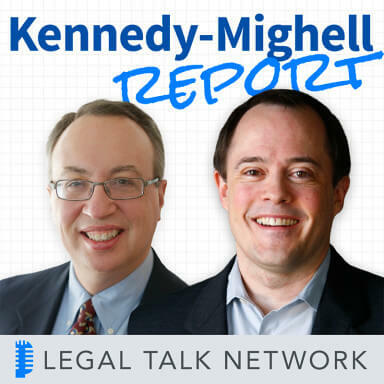 In this episode of The Kennedy-Mighell Report, Tom Mighell interviews Dennis Kennedy about LegalTech New York 2015, covering highlights from the show and what this year’s event might tell us about future trends in legal technology. As always, e-discovery was a big topic, with an estimated 54% of the vendors falling within the e-discovery category. Kennedy speculates that information governance will be a focus for 2015 as the legal community shifts toward records management, predictive coding, and TAR (Technology Assisted Review). This year boasted fewer new product announcements but many upgrades and new generations. Some interesting collaboration and matter management tools were announced, and Kennedy shares the coolest new thing he saw: an analytics tool that takes a dashboard approach with a user interface reminiscent of an app. In the second part of the podcast, Kennedy and Mighell discuss the current state of smartwatches, anticipation of the new Apple Watch (due out in a few months), and the benefits of wearable technology as an organizational tool, activity tracker, and a more socially aware way of monitoring phone activity. While Mighell says he won’t be converting to the Apple Watch from his Android Moto 360 any time soon, he is curious to see what level of success the gold Apple Watch will have, rumored to be priced at $5,000. As always, stay tuned for Parting Shots, that one tip, website, or observation that you can use the second the podcast ends. Dennis Kennedy: And welcome to episode 146 of the Kennedy-Mighell Report. I’m Dennis Kennedy in St. Louis. Dennis Kennedy: In our last episode we revisited the current state of speech recognition as part of our interest in taking a fresh look at technologies from the past that might have a new life today. In this episode we want to talk about my recent visit to LegalTech New York 2015, the big technology show and conference, and also the show that launches the legaltech year. Tom what’s on our agenda for this episode? Tom Mighell: Well, Dennis, in this edition of the Kennedy-Mighell Report, we’re going to recap LegalTech 2015 with me as the interviewer. In our second segment, we check in on the current state of smartwatches and the growing anticipation for the Apple Watch. And as usual, we’ll finish up with our parting shots, that one tip website or observation that you can start to use the second this podcast is over. But first, let’s get started on our first topic and that’s LegalTech New York. Every year at the end of January, beginning of February, the legal technology world braves the elements to travel to New York for a legal tech conference and I think this year was no exception as far as the weather was concerned. I wasn’t able to make it this year, but Dennis did go for the part of the conference. Since I’m kind of – as you can tell from my voice – a little bit under the weather this week, we thought that I would serve as interviewer to conserve my voice and let Dennis tell us about his LegalTech experience. Dennis, speaking of the Winter weather, how was the Winter weather on the East Coast? Did it have any effect on your visit or I guess on anybody else’s visit to LegalTech? Dennis Kennedy: It really threw a monkey wrench into things. I was planning to get there on Monday morning before the conference started on Tuesday. I ended up walking into my hotel in New York at 10:00 PM on Tuesday evening after five of my flights were cancelled to New York. And that was a pretty common thing, there were a lot of people had trouble getting out there. And probably more talk than usual of LegalTech New York becoming something like, say, LegalTech Phoenix, or Orlando. Tom Mighell: So for those listeners who may not know a lot about LegalTech, what is, in your opinion, makes LegalTech unique as a technology conference. What makes it different from, say, ABA TECHSHOW or ILTA? Dennis Kennedy: What I like about LegalTech New York is it’s huge. There’s tons of people, American Lawyer Media puts it on, and I think it’s a great show to see what’s new and happening in legal tech. It’s a great networking show and the people really come out, so you recognize a lot of people. A lot of the vendors have the top executive or the presidents of the company there and just a lot happening. So it’s a great place to see what products are out there. In a lot of ways, the focus to me is always more on the exhibit hall than on the sessions, whereas opposed to ABA TECHSHOW, I would say the focus is very much on the sessions, the education, the lawyer focus, as opposed to I would say LegalTech has a great industry focus. And I also think that LegalTech New York tends to be a bit more of a big firm and then I know we’ll talk about this, but heavy emphasis on ediscovery. So I would say maybe at LegalTech, more lawyer focused, more education focus, really practical about what you could actually do with technology. ILTA, to me, is much more advanced tech, focuses a bit more on the IT directors. The ILTA one has this family feel to it that I think is interesting, but definitely advanced tech with the IT people in mind. So that’s the difference from LegalTech New York for me. Even in the short period of time there, I got to talk to and meet a ton of people and see a lot of new products and things that were going on. Tom Mighell: That’s always been my impression of LegalTech, is how big it is, how many people are there, and in such a small location for the number of people that are there, just seems that it could do better in a bigger location. You mentioned before that LegalTech has always been very heavy on ediscovery as a topic. In the years that I’ve gone, everywhere you turn there are just dozens of ediscovery vendors all over the place. There’s lots of sessions on ediscovery topics, predictive coding in past years has been hot – not sure if it’s been hot this year. Tell me about ediscovery at LegalTech this year. Was it the same kind of crazy mess that it always is? Dennis Kennedy: It was pretty wild, because I went with some of my work colleagues and they were all commenting; everywhere they turned they felt there were ediscovery vendors. I know our friend JoAnna Forshee – I didn’t see her but I understand she did an analysis of the vendors, and it was something like 54% fit the ediscovery category. but it certainly felt like it was even a bigger percentage than that. I think there’s an evolution and I suspect that we’ll talk about this on a future episode, Tom, of information governance. There’s certainly a movement towards that so you see a lot more companies talk about being in that space, records management. I think that predictive coding has diminished in a sense that TAR is a big word so this technology-assisted review – which maybe be is a bigger category than predictive coding fits in. But a lot of sessions on ediscovery, some of the judges were well-known in that field around a lot of the companies. My friend, John Tredennick, had catalyst systems; handed me his new book about technology-assisted review. So I think there’s always a lot of cool things going on there in terms of the new technologies as they related to ediscovery. Although over the years I’ve gotten further away from ediscovery; it’s something that I’m actually involved in to an extent at all. Tom Mighell: I’m glad to see that the ediscovery people have finally caught up to the rest of us and discovered information governance. It’s something that we’ve been talking about for four or five years now, is being the important underlying foundation of ediscovery and I’m glad to see that they’re finally catching up to that. LegalTech, like you said, is the first legal technology of the year, usually because it’s the first conference, it’s also usually the first opportunity that vendors have to announce new products or services. And I think you said that you saw lots of new products or services. Which new products or services stood out for you? Dennis Kennedy: I was talking to Bob Ambrogi, who also does a podcast on Legal Talk Network, who felt that there weren’t as many new product announcements this year in typical years. So I get the sense of things being evolutionary and I was also looking at some specific things of seeing some new generations of things. There were some interesting collaboration tools, I thought, but I can’t really say that there’s a lot that really jumped out at me. But again, I had planned to go for basically two days and I ended up being there for 6 hours. So it was a runthrough for me and I got the chance to talk to a lot of people. Probably the thing that I thought was the coolest new thing I saw was something from a company called Sky Analytics – it was just apparently bought by Huron Consulting. And it’s a dashboard approach – and I think, Tom, we had dashboard on our old technologies needing to be revisited. But I really liked the user interface and the way they had focused on some areas that especially in a law department, you could look at outside counsel, spend, compare different firms, identify lawyers, do some budgeting, a lot of analytics. But the way the user interface, I thought was really great, looked like a mobile app. The information you could pull out of it looked really good and so I think that maybe that falls in that area of data visualization. So you’ve got all this data stuff going on in the back and you used to be where you would be typing queries and doing all of that. Now it’s more like it looks like a mobile app, you’re clicking on buttons, you’re double-clicking on things to get more detail, you see more graphs and stuff like that. So that was a really interesting tool to me and I know that other companies are doing some similar things, but that one I got a pretty good demo on and I really liked it. You could look at different regional things, so for a company like MasterCard, where I’m at, they could click on a button and compare to law firms in Europe and stuff like that. So that was a really fascinating tool, but I think giving sample of the genre, so that was good. But I would say many of the stuff that I was seeing was evolutionary. Seemed like there was a lot of some interested in. Microsoft has a new matter management tool that people seem to be interested in and also I could see there was definitely interested in the Office 365 and what that meant. Tom Mighell: Following LegalTech from afar as I do when I can’t make it, I usually try to keep up with it on social media and things like that. I found that the buzz was much less than most years. I just didn’t feel like I got the same level of excitement and some of that was around what I consider to be a lack of product announcements. I didn’t catch as many product announcements that were exciting to me or interesting to me. So maybe it was one of those quieter, more evolutionary years, but you said something that raised another question for me which was talking about data. In past years, or at least in the last couple of years, we started to see the raise of big data as a topic at legal technology conferences. Did you notice that at all in any of the sessions or any of the vendors talking about big data this year? Dennis Kennedy: I didn’t notice it, and again, I didn’t really get to any sessions, I really worked the exhibit floor hard. So I don’t think that anything that I saw that people were really positioning themselves in the big data field and I think big dad means different things to different people anyway. I’m not sure that at any legal conference that you’re going to emphasis the big data aspects of what you do. I think we’ve come a long way and the people who are lawyers kind of get the whole cloud thing now. I think to take the next step to big data, we’re probably looking for another couple of years before people have any level of comfort with that. Tom Mighell: Yeah, I agree with that, I just think that LegalTech would be the place where we would see it if we were going to see it at any conferences. So let’s stick with the vendor hall. I noticed a couple of blog posts and then I know you mentioned it, but there was something called CodeX from Stanford Law School that I think was part of the vendor hall. Can you give us a little bit of an introduction about what CodeX is and what that means? Dennis Kennedy: I’m a little fuzzy to some of the details of this, although several people explained it to me, but this is a cool thing. They took a portion of the exhibit hall and working through Stanford, which is where this CodeX project is at, and it’s the Stanford Center for Legal Informatics. They identified ten startup companies in this sort of, legal application space – but that’s not totally accurate. And they gave them, essentially, an aisle in the LegalTech exhibit hall and then you could walk around and see them all in one place. Typically, you’re talking to the founders of these companies there, and get an idea of what’s going on that’s new and completely new approaches to things. Tom, you know me, at TECHSHOW and at other shows, I really like going to the backend of the exhibit hall where people have paid the least amount possible for the booth because they’re just new companies that can’t afford all the new fancy stuff. But sometimes they’re doing really cool things and it’s new. So this really extends that and it puts focus on some of these startup companies, so I think that was cool and I think that generated some buzz. I ran into a lot of people who said they wanted to go up and see that area and when I was in the area, I ran into a good number of our technology friends, Tom, just in that space. So that was fun and there was a couple of interesting things there and some that people may be familiar with. There was a company called Shake that’s doing document generation, a company called Plainlegal that I talked to the founder for a while that was in the intellectual property area, especially trademarks. And then I spent quite a while talking to the co-founder of a company called PatentVector, which, to circle back to the big data thing, they put themselves squarely in the big data space and they’re using big data analytics to look at patents with the idea of saying, “Let’s look at the patent system and what you’re interested in and then allow algorithms and the analytics on big data to determine what are the important patents in your area and to help you.” That was pretty interesting, too. Someone outside where my expertise is, but I like the idea of saying we’re talking about patent lawyers have their own belief about what patents are important, but this is like turning on the data, looking at the connections between things all that sort of thing. Their analytics can come up with another way of saying what are important patents in your area. So that’s another one of these things where I think that they might be looking to selling to law firms, but that seems like something that the clients themselves might be interested in incorporating into their intellectual property programs. Tom Mighell: It sounds like there were a number of vendors out there, especially some of these CodeX vendors, that were giving something new and unique, a little bit different, a better flavor for something interesting in the vendor hall. I guess, just by hearing you talk, I hear that LegalTech was a big show; lots of people there, lots of interesting topics being discussed, but it doesn’t sound to me like it was just a “wow” show. To wrap this segment up, can you give us your feelings in general about it? Was it overwhelming as usual? Did it have a positive effect on you? How would you sum up the LegalTech experience; at least as you experienced it this year? Dennis Kennedy: I think it’s totally positive. I think that some of the lack of buzz or energy may be the fact that people were just totally worn out from trying to get to New York. I don’t know if you followed Ben Shore on Facebook on his ordeal to get there, where he had stayed overnight in Detroit, they lost his bags, almost everything you can imagine going wrong and then he arrived at the hotel like 39 minutes before he was scheduled to speak. So I think a lot of people were just tired from the travel and then things just got kind of compressed because I, myself, missed a full day of it. So I think it was good. For me, I sometimes feel that my experience of conferences these days – and I know you get some of this too, Tom – is that you get a little bit of the reality distortion feel because it seems that a lot of people know me and so I get the chance to run into people and meet them and talk to them and they sort of know. We had a couple of people mentioning the podcast and how they listen to it, so that was good. There was a great blogger event where I got to run into a lot of our friends, Kevin O’Keefe and others. One of the big things about this LegalTech was that Monica Bay, who’s done legal technology news for years and is about as well known as anybody can be in this area, is retiring this year from ALM. This was her last show and there was a special party and all these things around her. I did get to congratulate her, although she wouldn’t let me come close to her because she had what seemed like a big case of pneumonia. She sounded like she had a terrible, terrible cold. But one of the cool things there – and this is why you think that these tech shows are about technology but it’s really about people – but one of the cool things that we all talked about was Thomson Reuters, and again some of our friends there, Tom, decided to honor Monica by putting her face up on one of the gigantic Times Square TV screens. And they took her to dinner and they arranged it so that they were walking by right as her face showed up on the screen as a surprise to her and that’s totally cool. And I think that shows how in its own way, there’s that kind of family. We’re all networked and we start to know each other and we all have that common interest in technology that also extends to the human aspect of it. So very positive. I totally wish that i had more time, but glad to say hello to everybody that I did see and unfortunately there are people that I missed because I didn’t have enough time. But to me it got the year off to a good start, I’m looking forward to the ABA TECHSHOW. The CodeX thing has also inspired me on what might be a potential project coming up that we may be talking about in a future podcast. Tom Mighell: Thanks for the report, Dennis. Before we move on to our next segment, let’s take a quick break for a message from our sponsor. Dennis Kennedy: And I’m Dennis Kennedy. I’m starting to feel the anticipation growing for the Apple Watch; now expected in probably about two months or less. Tom has already been experimenting with smartwatches and I know I have no doubt that I’m going to be an early buyer on the Apple Watch. But I also had some recent experiences that make me very optimistic about wearables. We thought it might be a good time to check in on the Apple Watch and to talk a bit about smartwatches in general. Tom, do you like what you’re wearing now or are you going to move to the Apple Watch? Tom Mighell: Well, let’s get this out of the way first: I’m not moving to the Apple Watch. And the main reason for that is that you can’t have an Apple Watch without an iPhone and I’m not going back to the iPhone any time soon. I am still a firmly devoted fan of Android as my phone platform, so there’s not much I can do about that. That said, I do like my Android wear experience. I mentioned on a previous podcast, I bought the Moto 360, which I still think is one of the better Android smartwatches around. I think it has a few warts, but in general I think it’s a nice wearable. What I notice the most about wearing a smartwatch is that it considerably reduces my need to check my phone all the time. Any notification that I get on the phone now directly goes on the watch. So I can check phone calls, I can check text messages, email, calendar appointments, somebody posts to my social media, anything of that, I get notified and it comes on the watch. And it’s really nice to be able to just glance down at my watch rather than pick up the phone. There is something these days that is rude about looking at a phone when you’re with other people that looking at your watch seems less obtrusive and less of a problem and it’s something you can just glance at and check and dismiss very quickly. It’s nice. It’s also nice to see what specific app developers are doing on smartwatches. I use Todoist as my task manager, and I can now set tasks directly on the phone by speaking a few words to it. Two weeks ago when I was travelling, I had something pretty cool and I used my watch for the first time as my boarding pass. I know that both American and Delta will give you a watch-sized version of your boarding pass, which is really easy to scan and it was actually pretty cool to be able to use. I think these smartwatches are also really good as activity trackers. They’re probably not as good as a Fitbit or tools that are designed specifically for activity tracking, but I use Google Fit to keep track of steps. I’ve used the Endomondo app – I know, Dennis, you like that; it’s great for all kinds of activities. The one drawback that i have, and I think this is one area where Apple may excel in, is the inability to swap out wristbands. I have a nice leather band on my watch, but I really can’t wear it when I work out because the sweat’s going to stain the leather band. I can tell you this because I already ruined one leather band by working out with it. I love to be able to have a sports band that I can swap it out for, but unfortunately with the Motorola, it’s not a simple process to change that. In fact, Motorola recommends that you take it to a jeweler to change the watch band. I think that Apple is going to make it easier to do this so that you could have multiple watch bands. I’m not positive of that, Dennis, you might be able to tell me, but that’s really the one drawback that I see to the smartwatches and the wearables and I’m very high on them. I really like my Android device and I’m really interested to see what Apple’s going to do. How about you, Dennis? Dennis Kennedy: This kind of relates to your experience to me at a conference or meetings, Tom. I think that I’m probably notorious for having friends wonder if I ever look at my phone when they’re trying to text me or call me when I’m at meetings. I’m always at a place, I’m focused on talking to who I’m talking to and then I realize later that somebody has called me and left messages or texted me or something. My experience with phones is people know me as universally bad but what I find is that my work phone sometimes buzzes, sometimes it doesn’t, and I never know what to expect. But what I realized when I was at LegalTech New York is that to have this on my wrist and to have the vibration happen there and to have this notice so I can take a quick look down at it. I don’t have to fish in my pocket and I’m probably going to feel that. Actually, Tom, I think you and others are going to appreciate me wearing a watch because you might be able to track me down and have me get back to you. So that was my epiphany was that that in itself was going to be a great for me. Also, I think there’s that sort of good-enough at some other things that make it interesting, and plus this sort of unknown potential. But say I’m at LegalTech New York and I spend a day walking around. I’m curious because I didn’t have time to work out, I wonder how many step I get in that day, so how much activity did I get. And if I’m wearing a watch that handles that too, that’s helpful to me. So I think that sort of good-enough aspect of it, the notification aspect, and then I think the verdict is out on how massive or unmassive the reaction will be to the Apple Watch and I think that’s going to relate to how fashionable is it, does it make sense as a wearable, and probably the concern that people have of the battery life is another aspect of that. But I think that if you can find something like that notification thing and then the idea that you don’t have to pull a phone out of your pocket to do certain things. I think it could be huge as you’re already reporting. Tom Mighell: Yeah, and the thing that I’m most interested in about the Apple Watch is to see how much they’re going to charge for the gold one. I hear that they’ve already installing safes in the Apple store like jewelry stores now, so it’s going to be interesting to see how they do with a $5,000 watch that they try to sell and how successful that is. Dennis Kennedy: Now it’s time for our parting shots at one tip website or observation you can use the second this podcast ends. Tom, take it away. Tom Mighell: We’ve talked on previous podcasts and in other places about how Microsoft has finally brought Word and Powerpoint and Excel to both iOS and Android, and they finally brought the rest of the office suite – or at least the major parts of the office suite – in the past two weeks by introducing Outlook. So now if you’re an Outlook user, you can download the Outlook app free of charge for both iOS and Android. I’ve got it both on my phone and my iPad, it works great. It’s not incredibly complicated, but you can get to both your email and your calendar; even better, you can have multiple accounts. You can not only have your exchange account that’s part of Outlook, but you can also put an account from GMail or Yahoo or other services. And then I guess what makes it even better for people who use iOS devices is you can attach a document from an email from Dropbox or from another sharing service which you currently can’t do with the Mail app. So I think that’s a step ahead of Apple in terms of the ability to attach documents to emails. So Outlook app free in both the iOS and Google Play stores. Dennis Kennedy: I think that’s another great step in the evolution of the mainstream programs we use, moving to mobile; I think that’s really important and significant. I haven’t tried it but it’s really hard for me to not see how important that could be. So, Tom, before I give you my parting shot, I did want to mention that I ran into Adam and Trent and Lawrence from Legal Talk Network and I have my Legal Talk Network T-shirt, which I’m not sure you have yet. And just for them, I want to say that it probably would have been nice to have a watermelon on it but it’s just a plain black shirt at the moment. So keep your eye out for that, Tom, next time you see them. I did want to mention though, as my parting shot, the CodeX site, Stanford’s Center For Legal Informatics. So if you’re interested in what was happening there at LegalTech New York and what they’re doing in the startup area and the whole idea of venture capital and new legal application startups, I think it’s a good starting place to kind of get a feel for what’s going on and the new approaches to looking at legal, using technology, data analytics, and other things along those lines. Tom Mighell: Definitely. So that wraps it up for this edition of the Kennedy-Mighell Report. Thanks for joining us on the podcast; information on how to get in touch with us, as well as links to all the topics we discussed today, is available on our show notes blog at TKMReport.com. If you like what you hear, please subscribe to our podcast in iTunes or on the Legal Talk Network site. You can get to the archives to all of our previous podcasts in both places as well. If you have a question you want answered or have a topic for an upcoming podcast, please email us at [email protected] or send us a tweet. I’m @TomMighell and Dennis is @DennisKennedy. So until the next podcast, and while I’m waiting for my own Legal Talk Network T-shirt, I am Tom Mighell.